They're basically craft beer royalty. One of the reasons the American craft beer industry has exploded in the past decade — jumping from 1,511 breweries in 2007 to 6,372 breweries last year — has been the corresponding rise in the hobby of homebrewing. Similar to how rock bands practice in their garages in hopes of one day recording in a professional studio, a generation of craft brewers started tinkering with cobbled-together equipment and recipe ideas in their kitchens, with dreams of one day owning their own breweries. 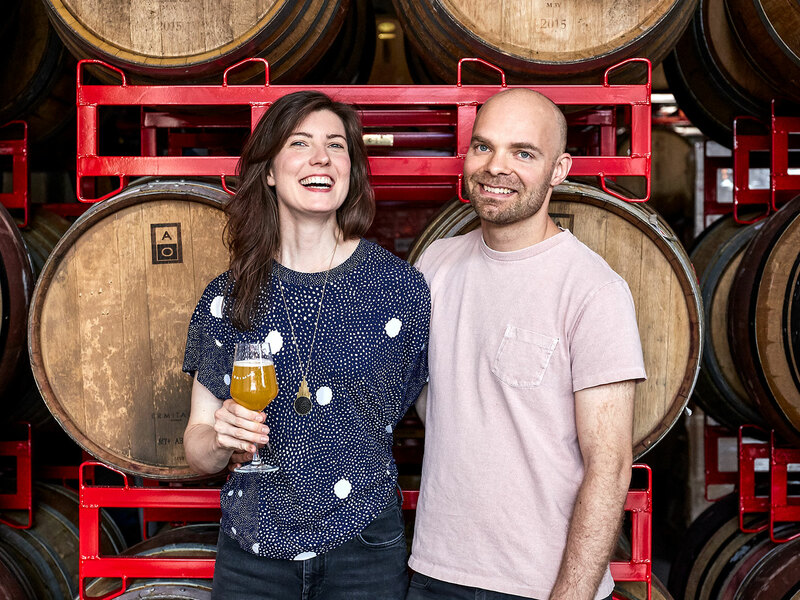 For Joe and Lauren Grimm, the husband and wife team behind Brooklyn’s Grimm Artisanal Ales, that dream will come true this Saturday when the couple officially opens the doors of their new brewery and taproom in East Williamsburg. But a funny thing happened on the way from the kitchen to the taproom: Grimm Artisanal Ales became a legendary brewery before the brand even had a brewery to show for it. The Grimms started their craft beer journey as “gypsy brewers” — a more romanticized way of referring to “contract brewing,” or renting out space in someone else’s brewery to make your beer. Despite the clear cost-saving benefits, contract brewing can have a negative connotation, conjuring up thoughts of absentee brewers letting someone else churn out beer on their behalf with little quality control. But a new generation of gypsy brewers that also includes big names like Evil Twin and Stillwater turned that idea on its head, creating acclaimed brews by using a hands-on, detail-driven approach even in situations that might not be precisely what they would have chosen left up to their own devices. As the Grimms’ interest in homebrewing grew during the late aughts, they created their own “homebrew CSA,” as they called it, getting friends to chip in money to fund their obsession. “We wanted to brew more beer than we could drink, and we wanted to brew more beer than we could afford to make,” explains Joe. “So we needed to broaden the number of mouths to feed so that we could brew several times a week so we could learn faster.” Interest grew beyond their friends, and in 2013, the couple landed in the first of a few commercial breweries where Grimm temporarily set up shop: Paper City Brewery in Holyoke, Massachusetts. A peek inside Grimm Artisanal Ales' Brewery. Double Negative — a massive 10-percent ABV imperial stout described as “jet black” and bursting with aromas of “coffee, bitter chocolate, caramel, black currant and blueberry” — was a huge turning point for Grimm Artisanal Ales. Joe and Lauren had already garnered plenty of buzz around Brooklyn dating back to their CSA days, but in 2014, just one year after the brand officially launched, Grimm took home a silver medal for Double Negative in the Imperial Stout category at the Great American Beer Festival. The next year, the same beer took home gold — an unlikely string of success at America’s largest beer competition, but especially one for a “brewery” that didn’t have an official home outside of the couple's apartment. That same year, Grimm took two of the top five spots in one of Paste magazine’s popular blind-tastings of double IPAs with their juicy, New England-style brews Tesseract and Lambo Door. The Grimm cat was out of the bag. As you might expect, around this time, the Grimms began pushing forward with opening their own space. 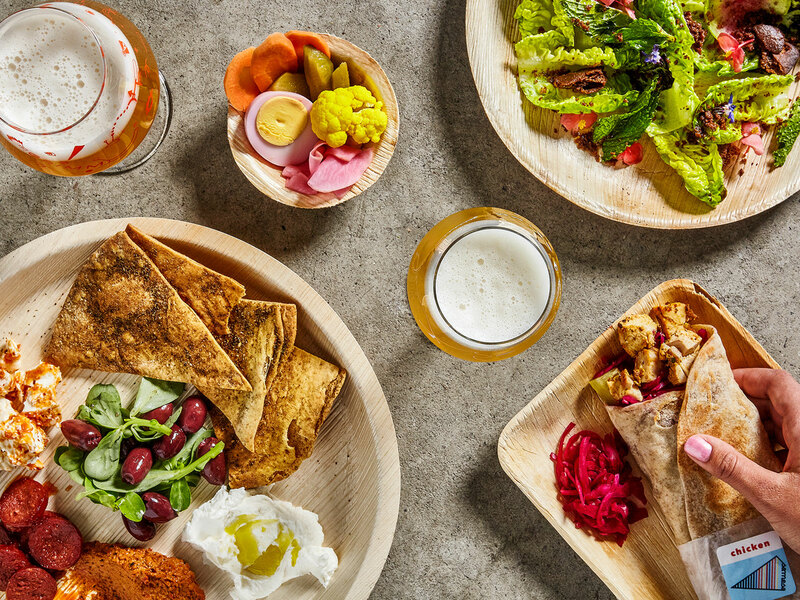 The brewery will serve a selection of food from nearby Samesa. Of course, though these details are essentially on display at Grimm’s new taproom — the facility has a minimalist style and an open floorplan with no real demarcation between drinking space and brewing space — most visitors will be worried more about what’s happening in their glass than in the 30-barrel brewhouse. 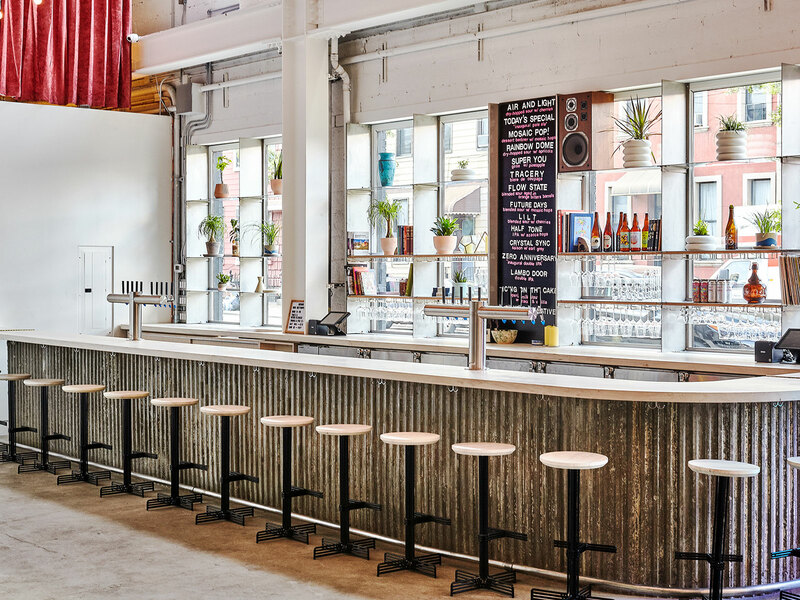 The brewery plans to offer somewhere between ten and 20 of their beers on draft on any given day, with growler fills and some packaged beers available as well. Those looking to mix thing up will also be able to choose from a selection of ciders and wine sourced from New York’s oft-underrated Finger Lakes region. And food comes courtesy of the nearby Middle Eastern-inspired restaurant Samesa. That reality takes another major step forward this weekend.